The term "global value chain" is not only a concept but also a real instrument that can help, according to top trading experts. China should actively participate in the global value chains to accelerate manufacturing upgrades and further drive up supply chain reform, said Qian Keming, vice-minister of commerce. A global value chain is a worldwide series of activities performed by a company, which aims at adding value to a product at every step during the production process. Given the challenge of the global economic downturn, it is necessary for China to upgrade its manufacturing capacity and further transform its economy to the high-end part of the global value chains, the vice-minister said. Integrated supply chains and industrial chains had made China an indivisible part of the global economic system, he added. Experts said that as an industry-centric view of economic globalization, the concept of the global value chain highlights the linkage between every player and activity that can create value across geographic space. It includes domains ranging from design, production, marketing, distribution and support to the final consumer. 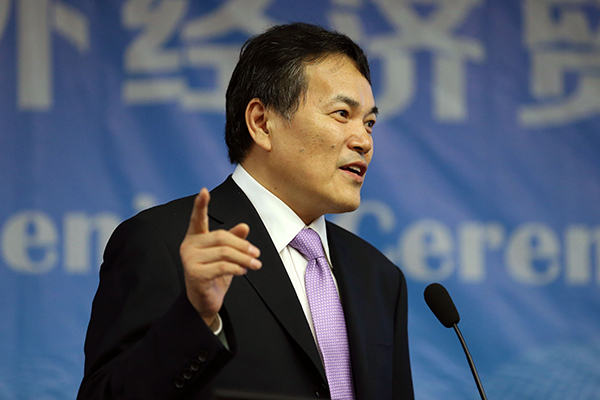 Zhao Zhongxiu, vice-president of the University of International Business and Economics in Beijing, said the recent G20 meeting of commerce ministers had reached consensus that an inclusive and coordinated global value chain needed the participation of developing countries and small and medium-sized companies. "To better accommodate the trend, China should focus on regional cooperation along the Belt and Road Initiative and the transformation of the economic growth pattern, especially on the reform on the supply front," said Zhao. The Research Institute for Global Value Chains, which was set up in the university earlier in July, aligned with a panel discussion, which invited participation from scholars around the world. Participating in the global economic arena and being part of the global value chain is indeed helping Chinese businesspeople, experts said. They pointed to startup companies from Chongqing, which have benefited from the inland city's transformation into a trading hub with Europe, due to the China-Europe transcontinental trains.